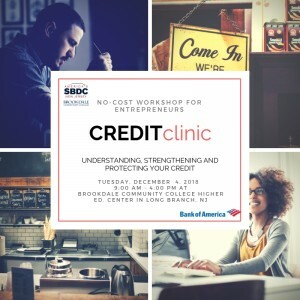 On Tuesday, December 4th from 9:00 am – 4:00 pm the NJSBDC, partnered with Bank of America, will offer a No-Cost Credit Clinic at the Brookdale College Higher Ed. Center in Long Branch at 213 Broadway, Room 116, Long Branch, NJ 07740, focusing on understanding, strengthening and protecting your credit. and most important why your annual credit report your BFF. Financials can be intimidating, even for seasoned entrepreneurs and understanding how to use them when setting up your business for success is achievable with the right tools. This event can get your credit and business going in the right direction. Although this event is cost-free registration is required. So Register Today!